The next industrial revolution has already begun. To remain a viable business, it’s time to invest in IIoT and Industry 4.0 applications, regardless of whether you are a “mechanical-only” company or not. 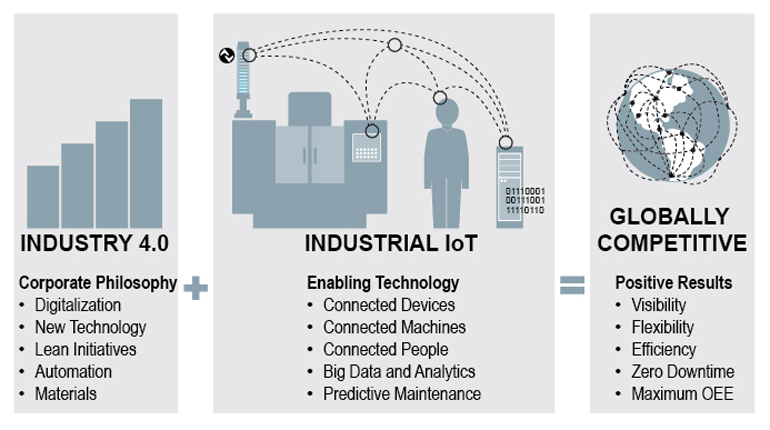 IIoT is simply about connecting devices on the plant floor to a network. These connections provide new ways to generate and collect useful data. This network can provide visibility down into the machine, enabling predictive maintenance and big data analytics. With IIoT, we are able to improve overall equipment effectiveness and provide new insights into our business. On a grander scale, Industry 4.0 is a blend of digitalization, new technology and practical decisions to improve manufacturing. Industry 4.0 aims to achieve unprecedented flexibility, efficient production and visibility at every level of production. 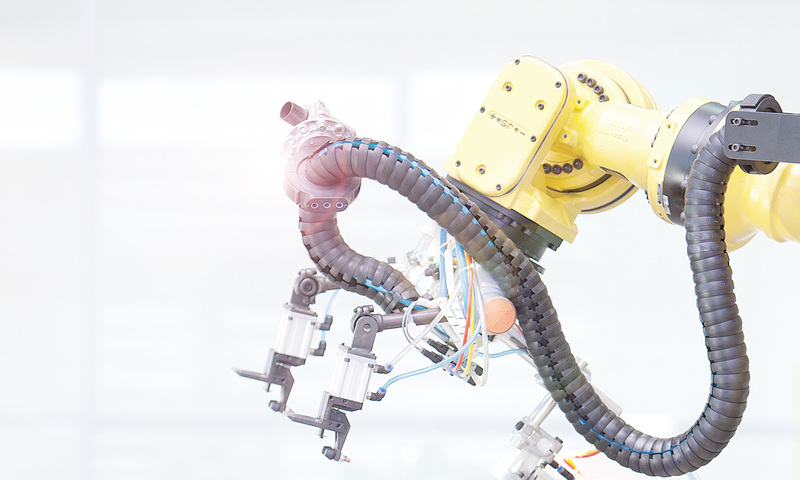 Industry 4.0 has impact throughout our processes and across the supply chain. Its philosophy blends lean initiatives, automation, technology, materials, downtime reduction upgrades, and investments in overall equipment effectiveness. This philosophy keeps the current generation of manufacturers competitive in a global market. While the German government set this precedent for Industry 4.0, the entire manufacturing world must now take on this challenge. Standard systems like hydraulic power units (HPUs) are receiving a major boost by becoming IIoT-ready. Traditional on/off flow or pressure switches are upgrading to provide information beyond the simple switch points. In addition, analog devices like temperature, pressure, flow, and level transducers can become IIoT-ready through open standard technologies like IO-Link. These technologies add additional value by incorporating easy-to-report parameters, diagnostics, events and warnings. A standard HPU can become a smart power unit with minimal modification. The value of IIoT increases with predictive maintenance, remote monitoring and ease of troubleshooting. Imagine not having to climb down into the oil-drenched pit of a stamping press to trouble shoot an issue. With IIoT-ready technologies, we can connect to the devices and know exactly what needs fixing. In addition, we can possibly predict the failure before it occurs. This can dramatically reduce machine downtime as well as the time spent in hazardous locations. Selecting IIoT-ready technologies is only one step of the program to fully leverage the value of Industry 4.0. We must also analyze processes and determine how to implement flexibility into production. After that, we must then discuss where automation technology makes sense to support lean processes. Manufacturers can see into every aspect of their production while manufacturing hundreds of variations of product in the same line, all while assuring quality standards with virtually zero machine downtime. Industry 4.0 is a cultural philosophy about how we can use increased visibility, flexibility and efficiency to be more competitive. IIoT’s connectivity is an enabling force for Industry 4.0. IIoT connects our devices, our data, our machines and our people to the advantage of our company and customers. By embracing both, it is easier to achieve positive results and sustain global competitiveness. Article originally posted on Hydraulics & Pneumatics. Thanks for sharing these clear insights into the case for IIoT and I4.0, Will. This next industrial revolution is quickly gaining momentum for all the right reasons. It’s all very exciting! Previous PostPrevious Choosing the Best Position Sensor: Does Yours Measure Up?